Ebay can be a wonderful resource for so many things. For example, there is always that one article of clothing that "got away" which you are just dying to track down. Ebay allows you to search for such items and if you are lucky, it might just turn up in your size! This is exactly what happened with me and the Kate Spade Easton Stripe Jillian dress in Sunflower. I always wanted the Jillian dress, but I could never decide on which of the many patterns and colors to choose from. 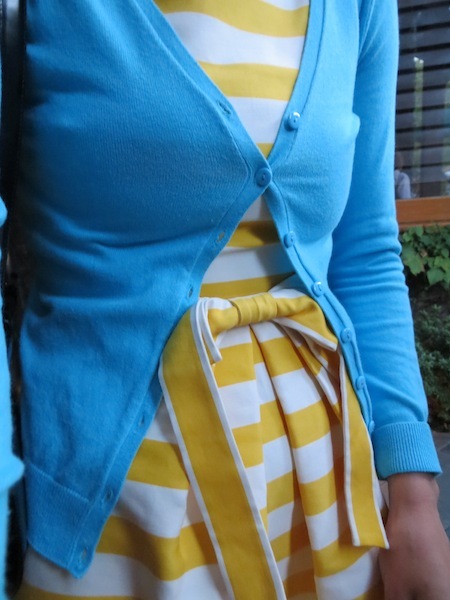 I came across some photos of the dress on the internet in yellow and white stripes and I was smitten! Sadly, this particular style of the Jillian dress was put out by Kate Spade a while ago and therefore not available in her stores anymore. Thus I started an epic quest for the dress which included searching high and low on Ebay. Luckily in a couple of months one came up, new with tags and in a size 2. Perfect! Well, almost perfect. I would have preferred a size 4, as this dress runs a little tight in the chest, but it actually still fits okay. I figured I might never see this dress again, so I would make the size 2 work! I won the dress after some very fierce bidding for about $139 which wasn't too bad considering that it still had the tags attached for $345. Here is me wearing my incredible Ebay score! There are so many ways to style this dress! I love the look of the yellow against a light blue color, so I selected the J. Crew Valentina Sling backs in heritage green (which is more of a turquoise color in my opinion). I also brought a similar color cardigan from H&M with me to wear over the dress just in case the weather got cooler at night (which it did, a little bit). Another thing Ebay is great for is random stuff that you have never seen before but just have to have! I honestly have no idea how I came across this bag on Ebay. All I know is that when I found it I had to have it because I had never seen anything like it before. The bag features an artist's palette and is from Moschino. One of my favorite things about this bag is that it comes with a real paintbrush which says "Moschino" on it. My husband suggested inserting a generic paintbrush in the bag when I go out, just in case the original one gets lost, which is probably a good idea. I really don't know too much about the bag, except it was probably made in the late 80's or early 90's. It was also made by an Italian company called Redwall for Moschino. If you know anything else about the bag please let me know! Here is a close up of my bag which I think is truly a work of art! such a lovely outfit! it's perfect for summer! I was in a bidding war with someone for that dress once on ebay two years ago and lost in the last second. I found out later it was one of my "blog friends" because she posted about it and how happy she was to get it! I am so sad that I missed out. I am seriously going to find it someday even if I am really old! 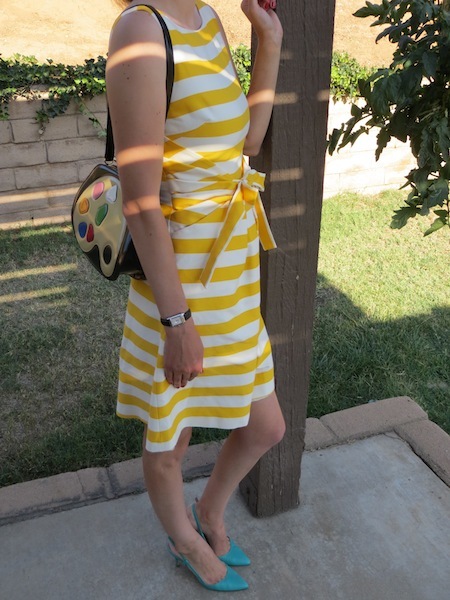 I have my fingers crossed that one day you will find the yellow and white striped Jillian dress Sandee! It is one of my all time favorite patterns for this style from Kate Spade. Thank you for the tip about the Kate Spade Piano clutch on your blog. I am so tempted to give the outlet a call tomorrow!